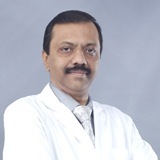 Dr. Dinesh was worked as consultant cardiothoracic surgeon in numerous hospitals of international repute like Fremantle Hospital Australia and Narayana Hrudalaya and Jayadeva Institute of Cardiology, Bangalore. Dr. Dinesh practices a wide spectrum of cardiothoracic surgeries ranging from all kinds of valve surgeries, septal defects, cardiac tumors and VATS. With a vast experience in cardiothoracic surgeries, his particular area of interest is in Beating Heart (off-pump) Coronary Artery Bypass Graft surgery. Dr. Dinesh can converse with his patients in English, Hindi, Kannada.